The govino® ‘go anywhere’ flute is a shatterproof drinking vessel that allows for an enhanced experience of drinking sparkling wine in settings whenever and wherever breakable glass may be inconvenient or prohibited. 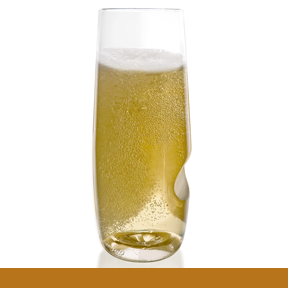 Its elegant stemless shape showcases the bubbles and helps preserve carbonation. Made of a BPA-free polymer, it encourages a healthy conscience when enjoying a glass of delicious bubbly.